This filly is by Gio Ponti Champion three times and earner of over $6,000,000. He won six Grade 1 races, including the Arlington Million and the Man o’ War at Belmont to name a few. His first foals are yearlings of 2014. He was the third leading sire with first foals and had an average price per yearling of $102,167 and a median price of $100,000. 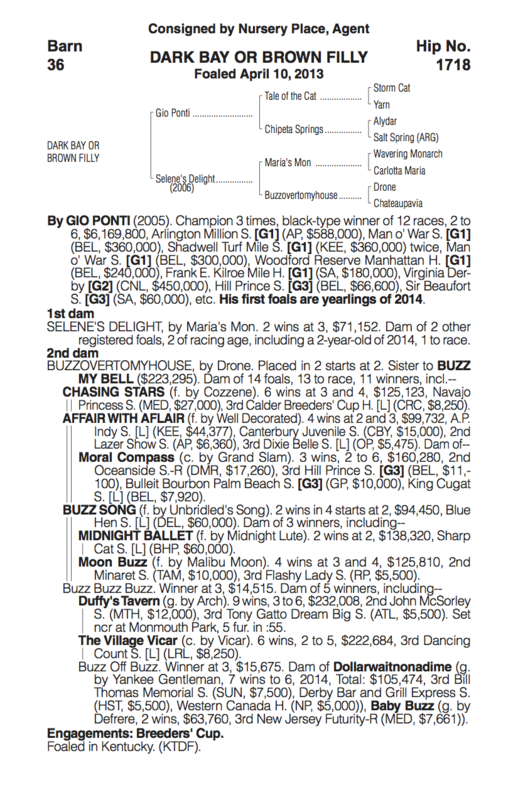 We paid $100,000 for this very attractive filly from a impressive family. She has a very well-balanced body, good chest and shoulder and good muscle. She is a good size and displays a very good walk. She is the best-looking Gio Ponti we have seen up to this point.